Currently in the Seattle area we’re in the midst of a bonafide “seller’s market”. A seller’s market is typically defined as a shortage of available homes to buy, compared to the available buyers in the market. It typically shows levels below an inventory of six months worth of available listings. 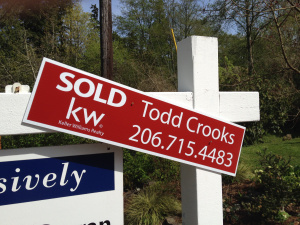 In other words, Most listings are moving in less that six months, start to finish. Last year, the number went as low as 2% in March and didn’t get that much better for buyers in December when it raced all the way up to a meek 3.7%. In March, a Zillow.com study put Seattle as the #5 ranked seller’s market in the US. That can be rough for a buyer competing for a home against other offers.